Have you worked on my rifle? You are welcome to send me an email or contact me via the Contact XTX page to check before buying a rifle that is being advertised/sold as "tuned by XTX Air". All I need is the make, model and serial number of the rifle, I will then look it up in my records and let you know if I have ever worked on it. How many shots will I get if I fit a regulator? First of all you need to understand that a regulator is designed to "regulate" the air pressure acting on the firing valve, which gets rid of the power curve that unregulated rifles suffer from, it is not designed to give you more shots per fill. Regulators normally allow you to fill to the maximum safe working pressure (SWP) of your rifle (normally marked on the side of the action or on the air cylinder) and allows you to shoot down to a lower pressure than you would if you were trying to keep within the power curve/sweet spot of an unregulated rifle. This often gives the added bonus of giving you a few more usable shots per fill.There are also a load of other factors that come into play with the shot count of a PCP, the biggest is the power you set your rifle to, the higher the power, the exponentially more air it will use per shot. 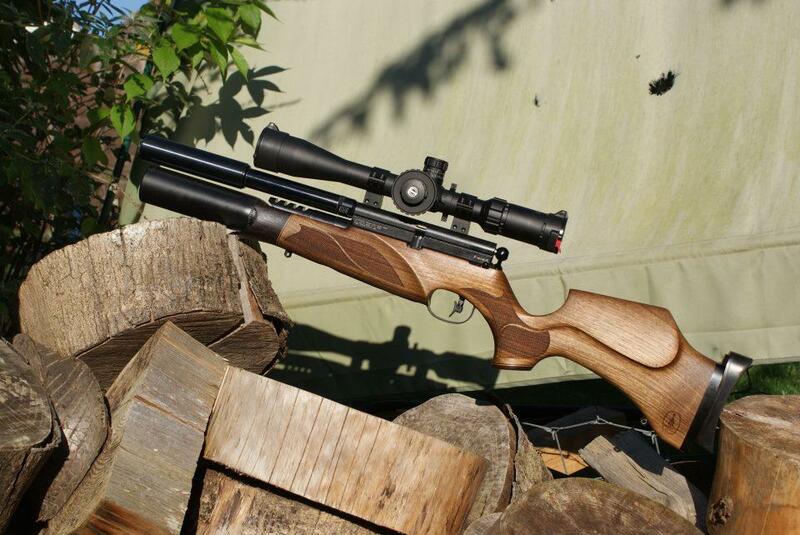 Other factors that effect the shot count are the way the rifle has been set up, the condition of the rifle, how tight/loose the barrel bore is, the size of the ports, the weight of the hammer, whether you have aftermarket hammer anti-bounce devices fitted etc etc. My regulator or accessory did not come with fitting instructions? Fitting instructions for the regulators and other aftermarket products I sell can be found on the fitting instructions page of the website. The eShop listings for the regulators and aftermarket parts have links to the fitting instructions and they say you should have a look at the fitting instructions BEFORE ordering the product, to make sure you are confident that you know what is involved, you have the tools and skills necessary to fit the product. There is also usually a link to the fitting instructions on the bag/packaging of the product you have ordered and there is a link on the business card that is included with each order. I don't send out fitting instructions with orders because most of them are in video format or very lengthy documents. It would be expensive to print them out and it will add size and weight to the order, which will add extra expense to both the product and the shipping. How do I book my rifle in for a service or tune? I used to offer a tuning service but I have stopped now, I am focusing on the eShop and development work. There are some other tuners listed on the Guides & Links page of my website, one of them may be able to help you with tuning, servicing or repair work. Something is not in stock in the eShop, when will they be back in stock? This is the million dollar question! Most of the custom parts I sell are made to order in small batches. Often they are made in between my suppliers larger orders, which means the manufacturers can't give accurate lead times or delivery dates, it is simply a case of waiting for them to fit my order in when they get a chance. If stocks of a particular product are low or have run out you can rest assured that I am trying my best to get the products made/sourced as quickly as possible. Your best bet is to make use of the "back in stock" notification service offered in the eShop, that way you will automatically be notified as soon as the part is back in stock. If I have tuned, serviced or repaired your rifle in the past and you believe something is wrong with it then please feel free to get in touch with me to discus the problem you are experiencing. I will do my best to remotely diagnose the problem and offer you solutions. I also have a load of helpful YouTube videos and guides that show you how to tackle most of the common issues you are likely to face. If the problem is directly linked to the work carried out by myself and it can't be dealt with remotely, then it may be necessary to send me your action so that I can carry out a repair/service. If you have bought a product from me and you believe it is faulty, please feel free to contact me via the Contact XTX page to let me know, I will do my best to sort it out for you. Please also bear in mind that some products I sell are made and/or imported/distributed by other manufacturers or distributors, who will have their own returns policies and warranties, which may differ from my own. Either way I will do my best to help. Can you tune, service or repair my rifle? I ship worldwide. The shipping costs are automatically calculated in the eShop checkout. There are some products that can't be shipped internationally, like aerosols, pressure vessels and most liquids. Please make sure you are legally allowed to import the products you are ordering from the eShop into your country, I will not be held responsible if you get into trouble with the officials in your country. Some countries may charge import duty and other taxes on imports, I have no control over these, please make enquiries with the officials in your country before ordering to make sure if/how much they may be. some BSA rifles have trigger adjustment screws, which the trigger latch rod/sear pin can latch onto, instead of the trigger sear, causing power differences. there are other factors but the above are the most common. How do I return a product if it is faulty? For product returns, please follow this >>link<< Please note this service is for orders that I have sent out in error or if the product is faulty. If you use it because you have changed your mind or you have ordered the wrong part, then the cost of the return postage will be deducted from your refund. the bolt/cocking handle is touching the stock when in the closed position, which does not allow the banjo and detent ball to locate properly.